Yale University – As one of the leading universities in the world, Yale represents the idea of “knowledge” and “great ideas”. 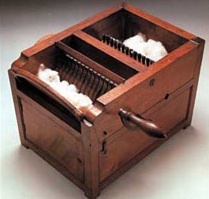 Eli Whitney – Famous as the historical figure who brought the concept of “mass production” to prominence through both the Cotton Gin and contracts to make rifles with interchangeable parts during the Civil War. Mr. Whitney represents the idea of the ability to solve a common problem “once” through his designs, then allow many people to benefit from his work via mass production. Our goal at New Haven Technologies LLC is to solve common business problems for a broad audience by providing transparency to the unique needs of each organization, but doing so in a way that can be replicated across many organizations. Dave holds an MBA in Marketing & Management from Indiana University, and a B.S. in Computer Science from the Ball State University College of Honors.